Discussion in 'The Lounge' started by chicodude, Jan 2, 2013. So its time to pull the trigger on a newer bike. 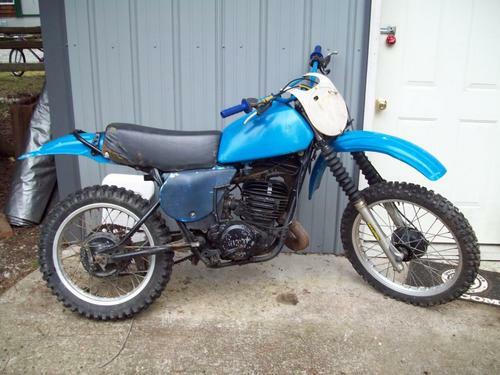 Its a 1979 IT 400. It was a good beginner bike. Sooooooo much power (See 400cc two stroke.) although the suspension and brakes are garbage, it has served me well. Now im on to the next phase, looking at a 2006 and newer ride, and I have made the choice to go 4 stroke as opposed to 2. My main decision now is do I go 450 or 250. I am 6'3 215 pounds, And I ride mostly trails and logging roads, with a fair amount of desert and track time coming too. I was exclusively on the 450 path but read some things that have convinced me otherwise. I think due to my size and the fact I have ridden a bigger displacement bike almost exclusively, that I am still thinking I should go with the 450. I also think that its something I can grow into. What say you moto monkeys? If ur handling the 400 2stroke with no problems, a modern 450 4stroke should be fine for you. Bear in mind buying an used 4stroke, unless you know the owner or there are detailed records is kinda like rolling the dice. Buy a six-pack of 50s. if you are comfortable with a 400cc 2stroke, then the 450 would be fine. most people i know who buy 250s are either racing them or learning.... everybody eventually moves to 450s. i´d go yamaha for a 450; and newer. 2006 is too old for a dirtbike, you will be rolling the dice on such an old bike. 2009+ should be ok.
Yeah, That was another concern of mine. I know there are many much more going on mechanics wise with a four stroke....anything I can look for or does the engine need to be stripped down and clearances checked? If you go to the trouble of disassembling a small motorcycle engine to "check clearances", you may as well plan to rebuild it while you're at it. At 6'4" 215ish, I rode a Husaberg 400 and a YZ450. I should have gotten the WR450 because the YZ was high strung for the woods. The Husaberg was the best bike ever, but required valve adjustments about every other ride and parts were crazy expensive. My next bike will be a YZ250 2 stroke with Rekluse clutch. <edit> The Berg was my first bike. 400 was powerful, but the bike was a tractor down low.